Photo of the special meeting on PBB convention which was chaired by Uggah (right). 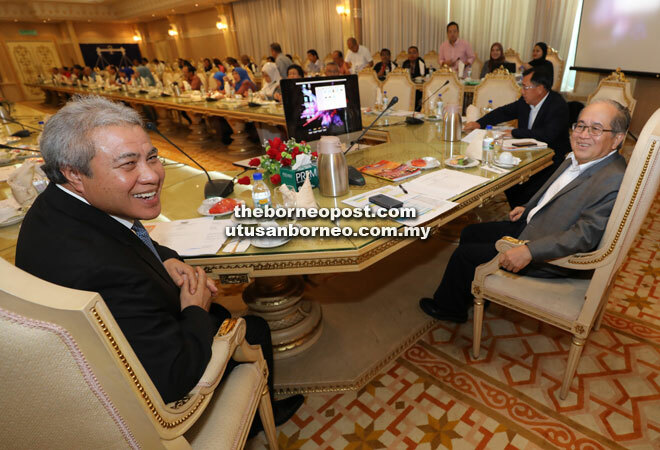 Seen on his left is acting deputy president Datuk Amar Awang Tengah Ali Hassan. 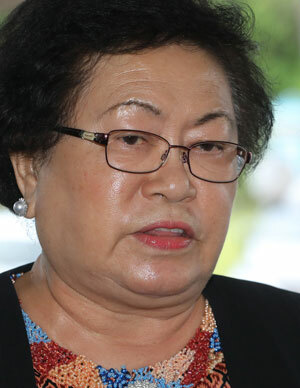 KUCHING: Parti Pesaka Bumiputera Bersatu (PBB) president Datuk Patinggi Abang Johari Tun Openg has advised that there should not be any contest for the party’s Wanita top post when the current Wanita chief Tan Sri Empiang Jabu steps down. This was disclosed by Empiang who said by mutual agreement Wanita deputy chief Dato Sri Fatimah Abdullah, will take over the post to avoid any contest for the top post. “By the logic of things and with the support from all the branches which have decided that there should be no contest for the top contest for the Wanita chief, so Dato Sri Fatimah, will be the next Wanita chief,” Empiang told the media after the special meeting for PBB convention at PBB headquarters here yesterday. Empiang also explained by the party’s convention, the Wanita chief post is alternated between Bumiputera and Pesaka wings and since she is from Pesaka and Fatimah is from Bumiputera it is appropriate for Fatimah to be the next Wanita head. Empiang, 74, wife of former PBB deputy president Datuk Patinggi Tan Sri Alfred Jabu stressed that she was stepping down as Wanita chief but not from the party. “I am stepping down as the Ketua Wanita. I am not stepping done from the party. I will try my best to assist in any way if my service is required as Wanita makes up almost half of party members,” said Empiang, who has held the post since 2007. When asked for his comments, PBB permanent chairman Datuk Amar Mohammad Asfia Awang Nassar said technically speaking nominations for the election of party post had closed yesterday at 6pm. “However, we need to sort out the nominations forms. So we will only know for sure by tomorrow when everything will be clear and then we will cast lots. As of now nominations papers have not been sorted out yet so I can’t tell you any details,” he stressed. Meanwhile, Uggah who chaired the special meeting for the convention said everything is now ready for the Wanita and Pemuda conventions which will be officiated by Abang Johari Tun Openg.